Whether you’re struggling to get views or you aren’t, for converting job ad views into applications, you need to review your job posting and recruitment processes. You can advertise job postings on your own site, use specialist recruitment agencies, and even consider advertising on social media recruitment sites like LinkedIn to attract candidates. Some factors, such as your location and the state of the job market itself, are out of your control, but there are ways to combat these problems too. Offer better packages, provide a relocation package, and ensure that your recruitment marketing practices are up to date. You should also look at the quality of your job ads to ensure that you are attracting the right candidates. 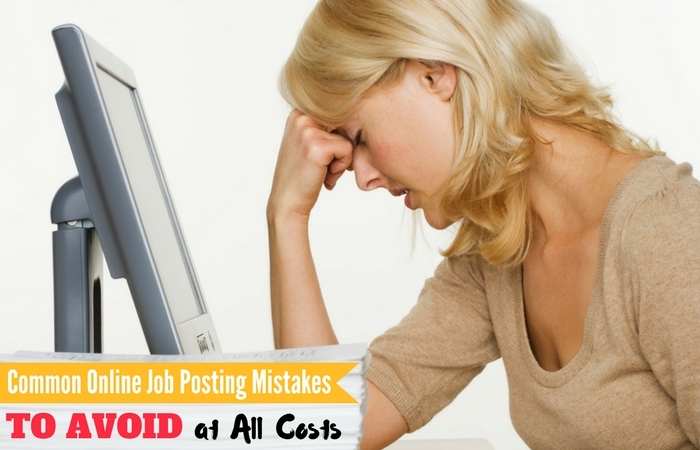 The following are common mistakes that are regularly seen in recruitment ads. Even a small change could have a major impact on your recruitment, and you could gain access to some of the best talent in the industry. Research suggests that over half of all job searches and applications are completed on mobile devices, and people are increasingly using their phones rather than laptops and desktops. This means that it is vital to ensure that your job postings are set up for mobile. If you use a recruitment site, ensure that it is mobile friendly or responsive. Also, ensure that the ad itself is formatted for easy reading on mobile screens. If you advertise positions on your own site, then every element of the application including the submission of applications forms, can easily be completed online. If your ads are not set up for mobile, you could be losing out on 50% of potential applications, so this is a major factor to consider. The specific job role for your post needs to be clearly defined. It also needs to be accurate and it should reflect the position details that are included in the job listing. If you are advertising for a PHP developer, then this should be the job role in your ad title. If you advertise for a developer, you will receive more views, but a lot of these views will bounce because there are many different types of developer and many different development roles. When people search for a PHP developer role, they may use “PHP” as one of the keywords that they search for, which means that you could potentially miss out on these viewers simply by being too vague with the job title you use. View your job posting in the same way as you would view marketing. The ad needs to be targeted specifically to the professionals that apply for that role. It also needs to be accurate and include appropriate details. Use websites and services that specialise in the type of role, industry, or sector in which you are advertising. The job ad needs to include specific and accurate details. Vague job ads will put a lot of viewers off, and by not including details you may lose out on searches and keyword searches. Some applicants will want to see details of the remuneration package and benefits, and if you have specific requirements regarding experience or skills, including these in your job ad will reduce poor quality and inappropriate applications. Include details such as location. Will the successful applicant be expected to work from the office all week, or will they have the opportunity to work from home? Include roles and responsibilities, any additional opportunities that might arise from employment, and any specific details that a potential applicant will want to see. While it is important to include all the specific information that applicants will need, you should avoid making the ad content overly complex. You need to find a happy medium that displays all the necessary information, but without making the ad content too complex. Complex application processes, or complex ad copy, will put a lot of people off too. If an applicant can’t easily identify how to submit their CV or continue with the application, they are likely to walk away without completing the application. A complicated application form is enough to put some people off. Try to minimise the questions you ask to those that matter, ensure that it is easy to include a CV, and consider leaving things like portfolios and work examples for a later stage in the application process. Your job posting is basically an advert, and you should treat it as such. The page should be targeted to readers, you need to ensure that there are clear Calls To Action employed on the page, and you should market your ad listings in the same way you would market the rest of your website. If you use a recruitment agency, they will conduct the marketing for your job application pages. They will conduct research, post ads to the most appropriate sites, and they will target ads to the candidates that you want to employ. If you want to ensure that your jobs are advertised to the right people, at the right time, and they get the greatest exposure, then using a targeted recruitment agency will ensure that your ads and listings are targeted to the right people. If there is one mistake that stands out above all others, it is using the wrong recruitment sites and the wrong recruitment agencies. The biggest job sites may have the most traffic, but it is rarely targeted. What’s more, a lot of them suffer from spam, which means that genuine job hunters and potential candidates probably look elsewhere. Finally, the amount of competition that your ad faces, means that you have to really stand out as offering the very best opportunity, otherwise you have no hope of reaching your target audience. Social media sites like LinkedIn have become one of the most popular means of advertising jobs and recruiting candidates, but this can take a lot of management because you will inevitably end up with cookie cutter responses from individuals that have no real intention of applying for the job. Use a relevant, high quality, and specialist recruiter to increase your chances of procuring the best candidates for any open position you have. About Author: This is a Guest Post from Matt who works at Recital Consulting. Recital Consulting is an IT recruitment specialist. They can help produce accurate, reliable, and highly targeted job ads to increase your chances of securing the best IT candidates for any open positions you have.